Hi everyone! Sorry for the unplanned hiatus there–truth be told, things have been pretty stressful for me lately, and I feel bad about having had to have apologize for late pages so frequently, so I guess this is a semi-announcement that the schedule may shift to just “weekly” rather than specifically Sundays for a few more weeks. Thanks for being so patient, everyone–I’ll still do my best to try to get a new page up every week from here on out. p.s.- Brainchild’s setting is contemporary, Allison’s phone is just a relic. I wonder if Allison running through that winged girl’s… wing means she can’t, in fact, touch people in their mutant forms, orrr if that didn’t count because it was a wing and not an actual limb. …now I need to see what happens if Nosilla bumps into a mutant limb that doesn’t exist on the human body. Suzanne, you do what you need to do. We’ve got RSS, we’ll be around. I hope things de-stress for you soon. Exactly this! Thank you for your awesome work, looking forward to more awesome work, whenever it comes, no matter how long you need. What relic? I’ve got one something like that. Why? Because it was cheap (yay for eBay!) and I already have a fully functioning tablet for everything other than phone calls. Beyond “can make phone calls,” my only requirements for my phone were compatibility with our network and the ability to switch the clock display to 24H time. Nosilla looks so cute in that penultimate panel! I honestly dunno why, but she does. Maybe she just seems legit earnest for once. Also, the monstery designs continue to be amazing. WHOA. I like how her vision looks like she’s in a bubble!! Did you learn nothing from when Allison implied that Nosilla wasn’t real? Well, not real in the sense that only she can perceive it. My theory would be that her concussion allowed her to see through into another dimension like a window, where everything is the same except people have monstrous qualities. Every other sense like touch and sound is percieved through her native dimension. Nosilla, though, who may or may not be Allison’s counterpart (but probably is) must have gotten trapped between the dimensions somehow and only Allison can percieve her, but only when she is seeing the alternate dimension. 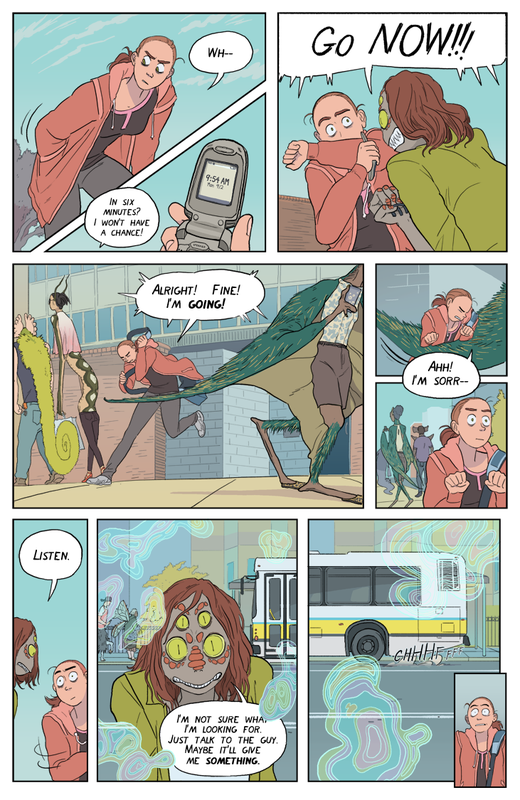 I didn’t noticed until the next page went up, but that bus made a very effective transition/screenwipe/thing to cover all of the people as the monster-vision faded. Nice work.